Temperatures this week plummeted to the lowest levels we’ve seen all season across much of the U.S. and everyday conversations are focused on how to keep warm and safe. One of the most important components to achieving cold-weather safety and comfort is effectively heating homes and buildings, which often rely on natural gas. 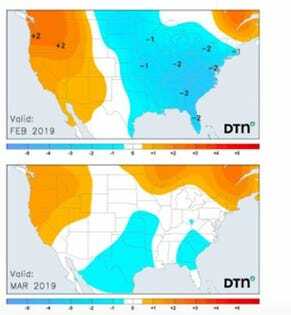 The natural gas industry is well-prepared to manage this cold snap and the accuracy with which they forecast weather is a major factor in pricing and supply levels. The east and central regions of the U.S. are the major natural gas users and the demand for it this week is likely to hit the highest level of the winter-heating season. Interestingly, as many of us experience temperatures colder than those in Antarctica during this cold snap, the impact on heating costs will be negligible as heating demand will drop quickly and significantly as temperatures warm up as early as this weekend. With this extreme cold, most people assume we’ll see a surge in energy costs as a result of high natural-gas usage; but not this time. It is true that the most significant driver for supply changes—at least in the short term—is the weather, with the temperature being the primary factor. For example, if a cold blast is forecast in the winter, natural gas prices generally go up because furnaces are cranked to keep buildings warm. But, this season things are working a bit differently. The warm December helped to eliminate the year-over-year deficit in inventory, which created a small, natural-gas surplus heading into this frigid week. In addition, current natural gas inventory levels are moving closer to the normal, five-year average, according to Dominick Chirichella, an industry analyst and director of market insights at DTN (Disclosure: this author works for DTN). With more than half of the winter heating season in the history books, Chirichella says it would have to remain cold for a sustained period of time for there to be a significant impact on prices. Natural gas pricing is rooted in the energy trading business; a business sector that’s heavily impacted by weather—and weather forecasts.Energy markets are affected by the slightest changes. Even a minor overnight change in a weather model or forecast can impact prices. In the winter, it’s not uncommon for a new, colder forecast to drive up energy prices by 5 percent, particularly if supply is already low. Therefore, if a natural gas trader can get a better forecast or faster forecast of a coming change than other traders, they can get an advantage in the marketplace. Lucky for us, according to a recently published mid-winter outlook that looks at weather through the remainder of the season is showing that there’s a weak El Niño system with us through spring which will bring more warmth, focused in the western portion of the country and bursts of cold weather east of the Rockies, at least through February into early March. Access to this kind of detailed forecasting is also helpful to energy traders, as weather risk is hyperlocal and any tools that can offer accurate, short and long-term forecasts stand to help traders make the best decisions, which ultimately determine the price Americans pay for natural gas. As the final hours of this current cold-snap tick away and we wake this morning to roughly 22% of the country below zero, we can find a small bit of warmth knowing that there won’t be a big financial hit to our pocket books because of it.